Nearly 40% of employers face challenges hiring qualified employees, while at the same time, one in four people in the United States have some type of disability, and have their own challenges in getting hired. Some disabilities are more visible, such as physical disabilities. Others are hidden, including mental health conditions, some medical conditions, and learning or cognitive disabilities. We also have a large population "aging into disability" for the first time, and veterans with disabilities returning to the civilian workforce. I am often asked about the types of jobs a person with a disability can do and my answer is always the same: "What do you have?" The reality is that the talent pool of individuals with disabilities remains underutilized, even though it includes job seekers with a wide and diverse range of education, degrees, professional certifications, work experience, and skills. Talent with disabilities brings alternative perspectives to getting a job done, solving a problem, and reaching a goal. It is this unique perspective and life experiences that can contribute innovative ideas, processes, and market reach. Individuals with disabilities in the United States alone represent an annual spending power of $645 billion. Their friends and families – those who would make spending decisions based on how inclusive and accessible a company may be – represent another $8 trillion in annual spending, according to the Return on Disability Group. This is both a talent and customer market that businesses want to engage! When your employees can give you a unique lens to a customer market, they can inform advertising, product development, customer service, and more. All of us have many roles in life, both in our work and personal lives, and bring our varied backgrounds, upbringing, culture, and prior experiences to the table. Individuals with disabilities are no different and cut across all dimensions of diversity. By attracting, hiring, and promoting talent with disabilities, we are also including their whole selves, with disability only being a piece of who someone is. For example, across our client base, employees with disabilities who have been hired ranged across several areas of EEO reporting: 35% women, 21% veterans, 19% Hispanic, 36% white, 42% black. Talent need: Synchrony (SYF) operates a large operations center employing over 1,900 employees in Ohio, housing a variety of business lines and roles including both B2B and B2C customer card services. When considering a location to pilot a hiring initiative spearheaded by their individuals with disabilities and veterans employee networks together with human resources, Synchrony considered factors such as a variety of roles with open opportunities, business line growth and projected talent need, leadership commitment, and regional talent resources. Due to growth and business need, the decision was made to begin by focusing on Customer Service and Inbound Fraud Representative roles. The approach: To achieve business results, we started with our discovery process to understand the business needs and inform our strategic playbook. This included job qualifications, work environment (including a "day in the life" analysis), business goals and objectives, and the application process. Although systems, policies, and procedures are not the sexiest topics, they are extremely important in identifying often easy-to-fix barriers to job seekers getting interviewed and hired. ...hiring efforts reaching beyond community partners to reach job seekers directly through word of mouth, social media, and other organic communication within the community. Based on discovery learnings, hiring managers and HR were prepared through training and best practice discussions, and we then began outreach together with HR site leaders to build talent partnerships on their behalf. Talent partners included veterans’ groups, colleges and universities, state workforce agencies, community organizations who provide services to employees, leadership and community organizations that participated in focus groups and individual interviews, and the input gathered was included in the discovery process. The Synchrony talent brand was an important piece of the outreach, as was hiring efforts reaching beyond community partners to reach job seekers directly through word of mouth, social media, and other organic communication within the community. The resulting strategic playbook outlined the steps for a pilot and other key recommendations. The first step was cultivating talent partnerships throughout the community to build a recruiting pipeline. Job seeker referrals came from a mix of partnerships, including veterans’ groups, non-profit organizations, and local colleges. We also attracted job seekers with disabilities with targeted advertising, and opportunities were posted on the Disability Solutions national Career Center job board. Once candidates were identified, Synchrony and Disability Solutions hosted "soft skills training," together with community partners, to prepare job seekers and to communicate information about available roles, qualifications, and work culture. We then provided leadership, hiring managers, and HR teams with training. Once the model was piloted, refined, and measured, we readied it for expansion across the organization. Exceeded initial pilot goal of hiring 45 employees with disabilities to meet their annual hiring needs, with 60 employees with a disability hired over 12 months. As of May 2018, have hired a total of 76 at pilot site in Ohio. Above average retention in first year reported. Expanded to a second operation center in Arizona where 28 individuals with disabilities have since been hired, including five work from home opportunities. Also, recently expanded to Orlando, across the organization, and throughout a variety of business lines. Their best practices were shared nationally through the CEO Action initiative – a commitment to diversity by CEOs. Pilots offer a unique opportunity to learn while testing and validating. A crucial key to success is to find the right talent partners. There are many organizations out there and it helps to have assistance in finding partners who will work with you to understand your business needs, and who can provide solid and consistent talent referrals. Host events, talk to the community, or work with experts who know the talent field. 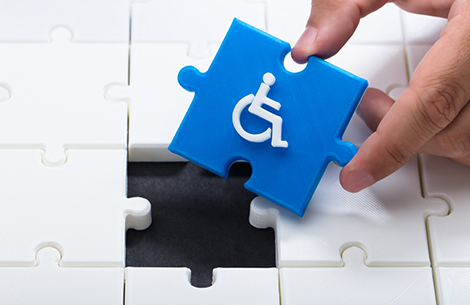 Don’t forget to ask how your brand is perceived by talent with disabilities. While talent partnerships are an important part of the recruiting strategy, direct outreach and the reputation you develop by taking real hiring action with the talent pool is how you will reach job seekers directly. When creating a disability hiring strategy, make sure that it aligns with your organization’s business priorities and systems. Don’t be afraid to make changes, but don’t "reinvent the wheel" either. Don’t worry about getting it perfect before starting. Just follow your plan, know that mistakes might happen, and learn from them. To make the process easier, leverage experts. Our team understands both the talent market and business needs. Find an experienced consultant who understands both and can bring that perspective to your team. As the competition for top talent increases, leading companies are searching for new and valuable talent pools. Those taking action in reaching talent with disabilities are recognizing measurable and meaningful business outcomes. What type of jobs can a person with a disability do? What have you got?